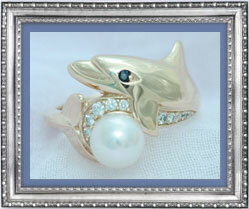 Specializing in Gold and Sterling Silver Sea Life and Marine Jewelry. Inspired by the Sea Creatures found off the coast of Maui, Hawaii, E.B. Alexander’s Maui Collection is teaming with beautiful Gold, Silver and Enameled Sea Life Jewelry, Get a glimpse of what our Maui Collection has to offer. Here at E.B. Alexander it has come to our attention that our favorite color is blue, so when we saw these beautiful pieces we knew we had to have them. 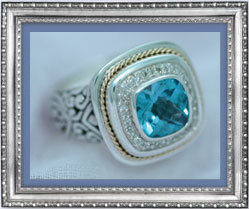 Preview our unique Blue Topaz Gems. Found not far from our Headquarters in California, the Monterey Bay is a Sea Life sanctuary full of life. From the Whales and Sea Otters to the Star Fish and Sea Weed the Monterey Bay is not to be missed.Take a look at what our Monterey Bay Collection has to offer. E.B. Alexander’s Inlay Collection is filled with timeless pieces. These classic designs have passed the test of time. Simple and elegant with a smooth texture you can’t help but feel beautiful when wearing a piece from EBA’s Inlay Collection. Take a peak at our Spiny Oyster, and Mother of Pearl Inlay designs. April 11, 2011: E.B. Alexander is proud to be donating a percentage of all sales in 2011 to the Louisiana Marine Mammal and Sea Turtle Rescue Program. LMMSTRP is coordinated by the Audubon Aquarium of the Americas in New Orleans, Louisiana. During the Gulf Oil Spill Disaster in 2010, LMMSTRP played a key role in rescuing and rehabilitating marine mammals and sea turtles that were in distress. LMMSTRP worked closely with NOAA, the Louisiana Department of Wildlife and Fisheries as well as the U.S. Coast Guard to help save stranded, injured and oil coated marine wildlife. Over 200 animals were rescued and treated by LMMSTRP's staff during and after the oil spill. Today LMMSTRP continues to help save marine wildlife in the Gulf. When a call comes in about a sea turtle or marine mammal in distress, the LMMSTRP team retrieves the animal and brings it back to the Audubon Aquatic Center for assessment and treatment. Help E.B. Alexander support this very worthwhile organization by making a purchase today! April 1, 2011: Spring is in the air and it's a gorgeous day in California! Take a look at our beautiful Heart Locket. This one of a kind gem can be ordered with red or purple Spiny Oyster Inlay. 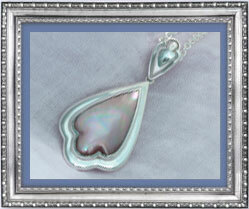 Our locket looks great with White, pink or black Mother of Pearl too. Which will look best on your mom on Mother's Day? March 30, 2011: Only 38 more shopping days until Mother's Day. 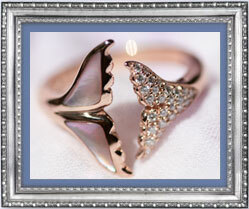 (May 8, 2011) Show your mother how special she is by presenting her with a beutiful piece from one of E.B. Alexander's unique collections. Experience the beauty of E.B.Alexander Collections in this jewerly video.